At UCCS, there has been an eight percent rise in students who need mental health services. This rise in the need for service is prevalent at each of the CU system campuses and each chancellor is focusing on ways to help their students. Below is a question and answer session with Stephanie Hanenberg, executive director, Wellness Center, and Benek Altayli, mental health services director. Altayli has eight full-time clinicians as part of her team at UCCS, with a ninth on the way. Q: What are some signs I should be looking for to know if I’m struggling or if someone I know is struggling? Everybody has a baseline and that baseline is different for everyone. Energy levels, level of productivity, how bubbly and outgoing, etc. is different and knowing your baseline and detecting a difference when it reduces your everyday functioning level would be the thing to watch for. For example, in the beginning of the semester if you could go to classes and do assignments without significant difficulty and socialize, but if all of that started to shrink and the ways you were functioning has been reduced, it is a good red flag to pay attention to. From the health side, students will come in not understanding that maybe it’s a mental health issue that’s going on, so they might come in because they’re getting sick repeatedly. A lot of times mental health stuff will turn into physical things – abdominal issues, chronic headaches, fatigue, sleeping too much and not being able to get out of bed, crying more frequently or being more irritable. They come in just trying figure out what’s going on, but when you ask enough questions you figure out that maybe there’s some anxiety or depression that’s causing a lot of that. Q: What are some first steps after realizing you might need some help? The first thing to consider is how far have you let it slide? If you’re at a point where you can’t get out of bed, you can’t eat, sleep normally or focus on anything, then that’s not a time where things can change if you let some time go by. But, if you’re at a point where you’re feeling down, but still doing okay or you’re doing everything your supposed to, but it doesn’t feel quite the same – try to exercise, eat healthier, connect with significant others or close support network and share some of the challenges to see if it makes a difference. If it doesn’t and your functioning level continues to decline, it’s a good idea to seek some help. Q: What should I do if I see these symptoms? A lot of people are worried about making things worse if they approach their loved ones when they notice something. The very first thing to remember is that you cannot make things worse for somebody because you’re caring and want to know how they’re doing and that you want to relay the message that you’re there for them. Being able to be open and caring will most likely provide a boost for that person, so don’t be afraid to approach them. Be very factual, “I have noticed XYZ has been happening and that makes me worried about how you’re doing and wanted to check in with you.” Lend an ear, make a plan, or you can share resources available on campus or off campus, but provide them the opportunity to tackle this together. Say “let’s ask some questions and see what they’re about,” that’s all it takes to show you care about them and want to be helpful. Q: What should someone do if they could harm themselves or others? You cannot make things worse by approaching and caring and asking. There are three steps to taking care of the people that we love that may have some suicidal thoughts. Ask about it. “Are you thinking about hurting yourself or does suicide cross your mind?” or “what you’re telling me is really challenging, does suicide enter into this picture?” Asking these questions outright is a good idea. Make appropriate referrals, connect them with the services. If somebody’s suicidal, that’s when we don’t want time to pass before they have access to some professional help. That’s not when we say let’s sleep on it and revisit tomorrow – you want to sound the alarm and make sure they’re connected with resources and spend that night in a safe environment. If somebody’s expressing ideas of harming someone else, we have the Student Response Team which includes Public Safety, Dean of Students Office and clinicians. They need to take that just as seriously as if somebody’s threatening their own life. Q: What should I do as a parent if I notice my son/daughter is not quite the same person they were when they left for college? Timing is important. Ask if they are doing okay or what’s going on, or say you’re noticing a difference. Ask very specific questions, instead of asking how’s school – ask how classes are going, if they feel adequately prepared, connected, attending things or missing stuff. If they start to identify things that may be a red flag, try digging a little bit deeper to see if you can identify signs and symptoms of depression and anxiety. Let students know you’re there to support them and its okay to be struggling because a lot of people struggle when they’re at college. Just make sure the student doesn’t feel as much pressure, because that’s what we’re seeing is students feel so much pressure to be perfect and so successful and that’s triggering some of this, just allow them to be who they are. The best thing a family member can do is give the information that you are partnering with them, not there to judge or be critical, that you don’t care how big the struggle is, you’re in this together. If a student is struggling with safety issues, their well-being is more important than college. College will always be here. They need to take care of themselves first and foremost. Q: How do you help people get over the mental health stigma? If somebody thinks about mental health in stigma terms, it may not be resolved in one conversation. Acknowledge that this is a difficult topic and there are cultural values attributed to the topic, but be open about your experiences with therapy, anti-depressants, treatment and tough times where you needed professional help. Share your personal experiences where it would be helpful for the other person. What we do here is nothing outside of your vocabulary, we just tap into resources you have and how to use them differently or more to get through this difficult time. The reason we designed the integrated center we have is because it’s one waiting room. Nobody knows if you’re there for a flu shot, mental health or a stubbed toe. A lot of times, students will come through on the health side, and there’s a hallway between health and mental health so if they do have that stigma or is trying to figure out what’s going on, the health care provider can immediately connect them with a clinician. If that’s what gets them in the door, then that’s what we try to do, because ultimately they’re going to get the same care which is most important to us. 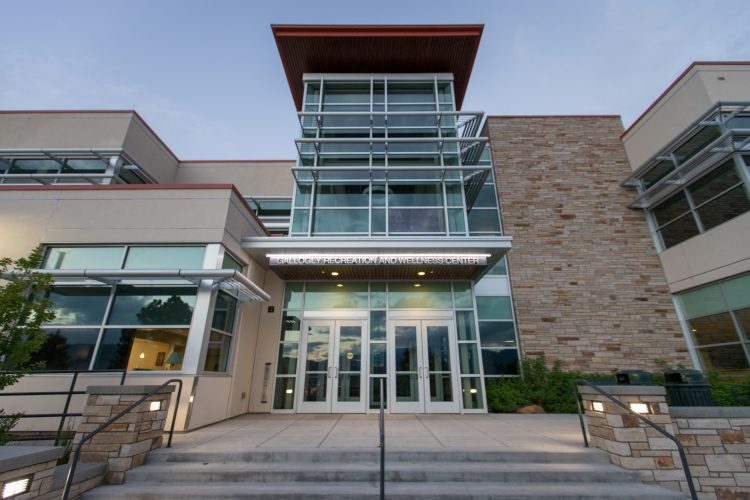 Q: What resources does UCCS have? UCCS has a psychiatric nurse practitioner. She will prescribe medications to help those who are struggling with a variety of mental health illnesses. Like we’ve been talking about, the Wellness Center provides health and mental health services. There are also dietitians that can help with nutrition, and because we’re with campus recreation, we prescribe exercise as well. Every day about 10-15 new calls come in. Currently, it’s impossible to attend to every single person, but we first screen for the urgency level – if someone’s life has come to a halt, we attend to them immediately. During the initial contact, we also talk to them about community resources in addition to our resources. If they have health coverage or Medicaid, there are more than likely community resources that could provide them with professional mental health services where they may be waiting for a shorter amount of time. We educate them on providers available to them, how to interview a clinician to see if it’s a good fit, and how to ask about their wait times and compare them to ours. We try to diversify how we provide services because not everybody is going to be able to get in immediately at the Wellness Center. Q: What was the Wellness Center like 10 years ago? In August 2008, Benek was the only person for mental health. We are a school, not a mental health facility. Our mission is always academically driven, but if somebody is not able to function, you can’t really hope to retain or recruit students who need support. We needed to make sure support is in place. Since then, we have created positions, built our space designed for our vision, all thanks to tremendous support from the administration. In the past two years since the integrated model was built, we grew 113% in visits between health and mental health. We already outgrew the projected vision for demand in that short amount of time. Q: What is the cost for students? It is $15 per visit. We have partnered with the veteran’s office where they will reimburse military personnel for up to seven visits. Occasionally, we will also have grants that take care of the cost depending on the type of treatment. Nobody, for as long as we are there, is going to be turned away for inability to pay for our services. We make sure that everybody on this campus has access. Q: What are your top tips for students to get through this time of year? Don’t drink energy drinks at midnight. This is the time where people get rid of their good habits. They may eat something on the run that’s not healthy, not exercising because they’re so busy studying and not sleeping enough. All the habits that help keep them stay well go down the drain. That’s when we see them get sick physically and crash mentally. Making sure those are at the forefront like eating well every day like exercising because there’s a direct connection between that and stress, sleeping plenty because they’ll always perform better on a test than if they’re sleep deprived. Find those people that will encourage them, like family or friends sending encouraging texts. They can also use their resources, like going to meet with faculty, Excel Centers, First Year Experience office and just seeking out help to make sure they feel supported through the end of the semester is really important. Q: What support is available for employees? We have the employee assistance program – can get six visits with someone to talk about any issues. If it’s something that extends beyond six visits, they will help connect them with their insurance to find someone in the community. There’s also the employee hotline, we encourage faculty and staff to use that. Benek Altayli is also happy to help connect faculty and staff with community resources. There’s also a faculty and staff response team. It’s important to support each other. For information or to schedule a visit, contact the Wellness Center at (719) 255-4444 or visit their website. —-How do you help people get over the mental health stigma? I suppose instead of simply repeating people who say there is one, you educate them. Repeating their prejudice helps not at all.